Brilliant audio quality makes this a good choice for users wanting to up their game, but the single polar pattern and slightly unsteady tripod bring it down. It’s easier than ever to be heard online these days. That’s both figurative and literal; a glut of microphones are on hand to give would-be streamers, podcasters, and YouTubers a voice. How do you stand out in such a crowded market? Rode’s answer is simple. Its NT-USB claims to offer “studio-quality sound” without studio-quality prices... and the developers might just have managed it. Sleek and reassuringly solid thanks to its narrow metal body, the Rode NT-USB is a good-looking piece of kit. It also has the build-quality to match. With side address and a cardioid polar pattern (which means it captures sound directly in front of it with a little ambient noise from the sides), it’s aggressively geared toward voiceover, singing, and instrumentals. That’s reflected in the NT-USB’s marketing, and there’s a sense it’s designed for those who already know their way around a microphone. This, its advertising implies, is the closest you can get to a studio setup without spending horrific amounts of cash. A faux-leather carry bag and zero-latency headphone jack help underscore that premium feel. Although it’s more expensive than its competitors at $167/£155, it’s compatible with PC, Mac, and iPad. Additionally, the NT-USB is dead easy to set up. Simply plug it into the device of your choice and hit ‘record’. When paired with a 6 meter cable, it’s perfect for anyone who needs to change recording location on a regular basis. Including a detachable pop filter only makes the NT-USB more enticing, of course. This metal shield is designed to combat irritating plosive sounds (the hard ‘P’s or ‘B’s that cause a mic to freak out), and it’s essential for the likes of live streaming or podcasting. You’ve normally got to buy these separately, so having one right out of the box is a welcome bonus. The arm that holds the pop filter may not seem very solid, true, but it does the job when you’re recording. It’s a similar story for the desk tripod. Despite giving the impression of spindly fragility, it’s stronger than you’d think. In terms of performance, the Rode NT-USB delivers fantastic audio. It’s impressively sharp and is perhaps the best standard of sound I’ve heard on a USB microphone. It’s got a talent for filtering out background noise as well; when using it in our busy office, the chatter of my colleagues was reduced to a murmur that never distracted from whatever I was recording. That doesn’t mean it’s not precise, though. Even when the subject is a short distance away (and behind computers, in my case), the NT-USB performs admirably. This is thanks to the cardioid polar pattern, and I’m only sorry it doesn’t provide other options on top of that. Cardioid is excellent for vocals or voice-over, but hosting a podcast with multiple guests or conducting a face-to-face interview may be tricky for exactly that reason. When compared to rival Blue Yeti or the Samson G Track Pro’s range of patterns (cardioid, bidirectional, omnidirectional, and stereo for the former), the NT-USB is therefore something of a one-trick pony. It’s a case of give and take, though. Unlike the Blue Yeti, it sidesteps the low-level buzz that plagues other mics. Rather than a quiet hum of white noise running beneath everything else, its audio is crystal clear. Happily, no mucking about in the settings is required to achieve this either. Although you can twist the knobs to focus on your subject (direct microphone signal) or a backing-track you’re playing to, I didn’t find a need to do so — the levels were spot on from the get-go. Throw in its plug-and-play nature and you’ve got a supremely user-friendly device. Well, apart from a glitch where I could no longer hear my audio via the headphone jack while recording direct microphone signal, anyway (this problem resolved itself immediately upon plugging my headset into the computer, and I didn’t have any other problems when listening back to or monitoring content). That said, the NT-USB does stumble over the bane of all standing microphones: vibrations from table knocks and the clack of keyboard keys. It picks these up all too well, and the minimal padding on the tripod does little to cushion it from them. I’d imagine a shock-mount or boom arm would help, but those are obviously not included with the mic itself. At least it’ll look good on your desk. As you can see, this is a handsome microphone. The NT-USB’s elegant form-factor helps it look classy and professional in any setup, while the painted white icons leap out from its black bodywork. One of the few criticisms I have is that the dials are completely smooth; this makes them difficult to grip. If you’re in the middle of a stream and have to turn them blindly, it’s hard to tell what you’re doing, if it’s worked, or where those dials are now pointing. Still, everything else is well thought out and you could never accuse Rode of being cheap. For example, the tripod is much more secure than first impressions suggest. It’s easy to upgrade to another mount, too; everything detaches quickly and it’s an adaptable design that’s equally suited to use on a desk, boom arm, and more. Unfortunately, the offset tilt of the mic leaves something to be desired. Despite the base being much sturdier and stable than it seems, it’s still not perfect — I noticed it wobbling unsteadily whenever our table was knocked, and if you don’t have the mic itself at the right angle it’ll topple over due to being top-heavy. That’s not to say the NT-USB tripod is unsafe, of course — it’s more that I don’t trust it. It’s a shame; almost everything else is amazing. Overall, if you’re serious about voiceover (be it for streaming, podcasts, or something else) and fancy dabbling in music as well, this is the ideal microphone. Brilliant audio-quality trumps the competition in almost every regard, and the inclusion of a pop filter helps seal the deal. While its cardioid polar pattern reduces versatility, the NT-USB excels at what it does nonetheless. 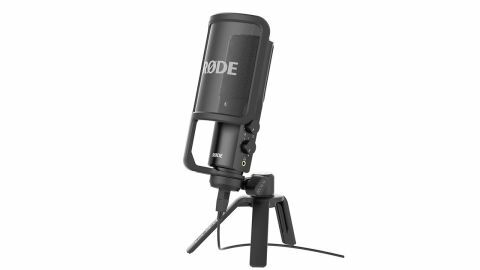 We’d still suggest a Blue Yeti for anyone starting out thanks to its lower price and adaptability, but Rode’s alternative is a fantastic choice for those looking to take their hobby further.